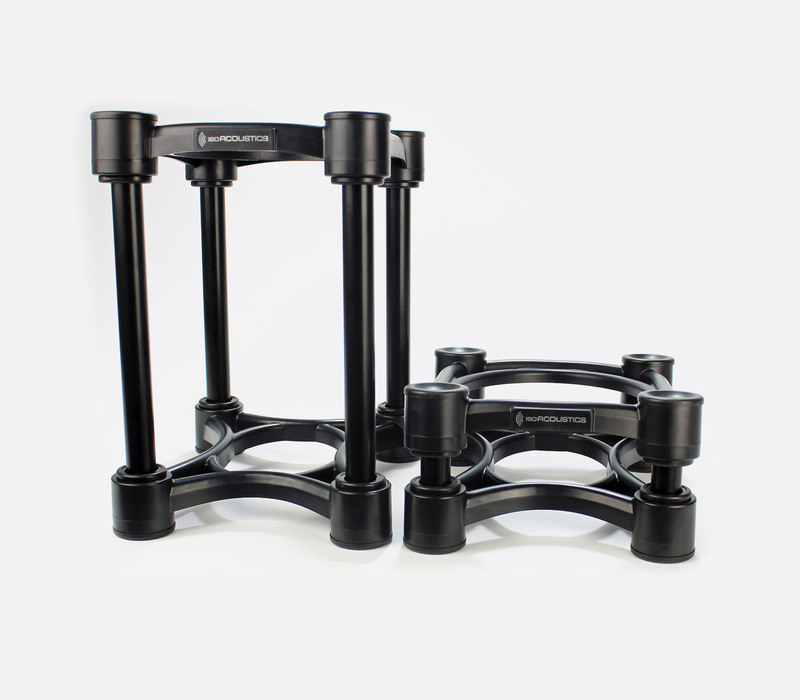 This IsoAcoustics ISO series of specialised speaker stands have been designed for the audio professional, music hobbyist, audiophile and music lover. With 'unique patented isolation technology' the speaker 'floats in free space', 'eliminating energy transfer' to the workspace or floor. This additional inertial dampening offers the potential of tighter bass response and less coloured sound projection. All models are height and tilt adjustable by using the included inserts and steel poles. 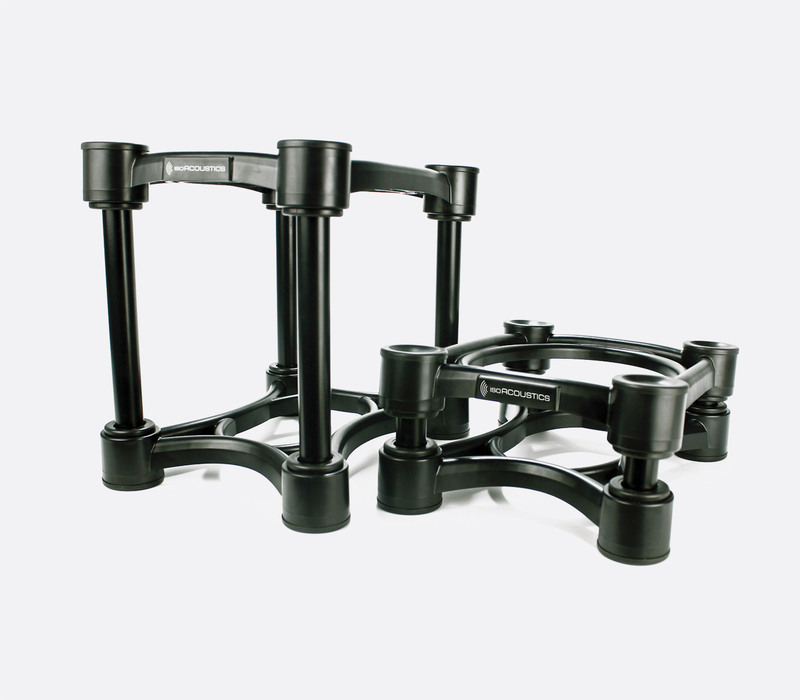 Rubber type pads on the top and base of the stand retain position and speaker stability. 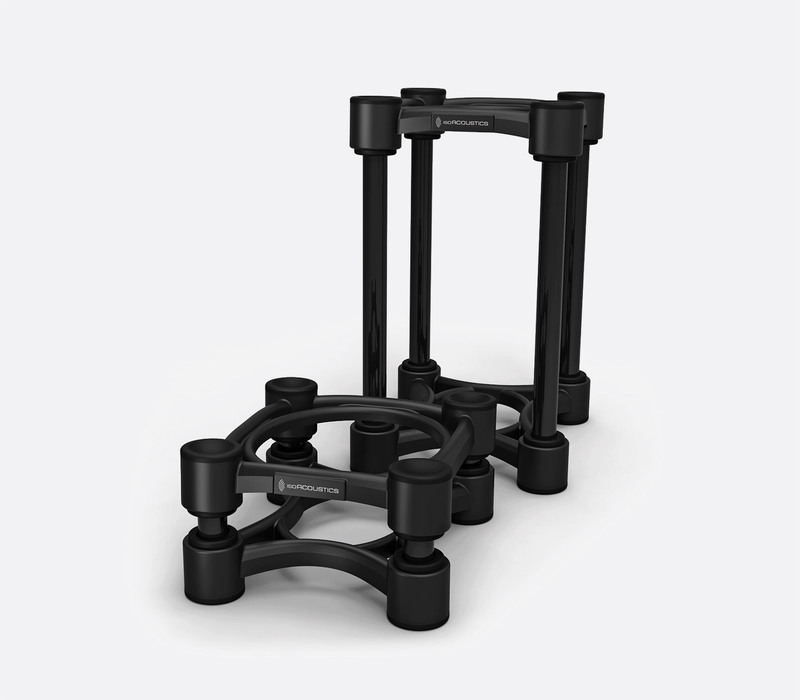 The 130 speaker isolation stands were designed for small to medium sized speakers and studio monitors. By using the included long and/or short steel tubes and plastic inserts between the high-density plastic moulded tiers gives fourteen variations of height and tilt. Dimensions: 130 x 150 x 80mm (w x d x h) short; 130 x 150 x 203mm (w x d x h) tall. Weight: 9kg. With the same features as the ISO-130, the ISO-155 was designed for medium sized speakers and studio monitors. Dimensions: 155 x 190 x 95mm (w x d x h) short; 155 x 190 x 225mm (w x d x h) tall. Weight: 18kg. The ISO-200 was designed for larger sized speakers and studio monitors, and still offer fourteen variations of tilt and height adjustment by using the included poles and inserts. Dimensions: 200 x 254 x 125mm (w x d x h) short; 200 x 190 x 225mm (w x d x h) tall. Weight: 27.2kg. The ISO-L8R430 was designed for large studio monitors, horizontally positioned monitors, and guitar amplifiers. Using the included steel poles and inserts the isolation stand can be positioned with a 6.5 degree upward or downward tilt. Dimensions: 430 x 230 x 125mm (w x d x h). Weight: 45.4kg.